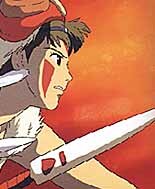 In 1998 animation history was made in Japan when the feature length animated film, Princess Mononoke, became that nation's top movie of all time... both in terms of popularity and box office sales. Created by master animator Hayao Miyazaki, Princess Mononoke is the tale of a Princess who fights against the destruction of forests in a fantasy 14th Century Japan. Mononoke opened in Japanese theaters July, 1997 and appeared on 250 screens throughout the country, making it the largest theatrical opening ever for an anime. On October the 29th, 1999, Princess Mononoke opened in theaters across the United States, marking a historic juncture for anime in the Western World. Being in Los Angeles I saw the film in a theater on the world famous Sunset Strip, and the audience of jaded Hollywood film buffs were spellbound by its beauty! Distributed by Miramax Films and featuring the voice talents of Hollywood Stars Billy Crudup, Claire Danes, Billy Bob Thorton, Gillian Anderson and others... Mononoke was masterfully dubbed into English and is actually the only anime dub I would highly recommend. Not only is the animation and story line far superior to anything American audiences are used to, but you'll find the gorgeous music composed and arranged by Joe Hisaishi to be unforgettable. Miyazaki is considered the greatest living animator in Japan, but he's also held in high regard by lovers of animation all over the world. In 1998 Disney signed a ground breaking deal with Miyazaki to distribute his films in North America. The first Miyazaki film to be released by Disney was Kiki's Delivery Service (Majou no Takkyubin). "Kiki" has enjoyed success in the U.S. video market, but with the release of Princess Mononoke in theaters all over America, the brilliant works of Miyazaki are finally being discovered in the West. The setting for Princess Mononoke is a forested area of an ancient mythical Japan. Lady Eboshi (voiced by Minnie Driver), leads a village she wishes to be a kingdom for oppressed people. The village smelts steel for weapons and so sets itself at odds with the primeval environment. San (voiced by Claire Danes), was raised by the wolf God named Moro (Gillian Anderson), and in an attempt to save the forest becomes locked in battle with the people of Lady Eboshi. The visual style of this film is nothing short of incredible. It is the most lavish and detailed work of art you shall ever see in animation. The background paintings alone for each scene are masterworks. 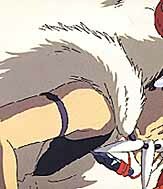 Princess Mononoke flawlessly combines traditional cell animation with computer technology. Silicon graphics workstations were used to assist in digital painting, composition, and generating images, yet the anime does not have the "look" of computer animation. The success of Miyazaki's film lies in its ability to appeal to all age groups. Children are attracted by the anime's characters and amazing animation, but adults are enthralled by the emotional complexity of the film. Princess Mononoke also has a very strong and timely message about ecological destruction and how we must work to preserve nature. I can't recommend this anime highly enough, it is a must see for all film lovers. A subtitled DVD release of this film is now on the market - and you owe it to yourself to get a copy.